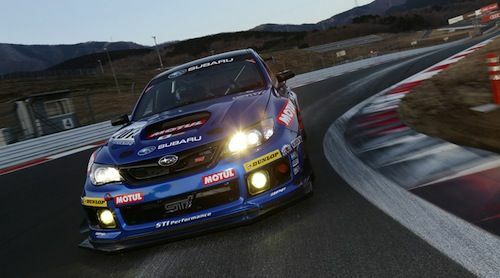 The new 2013 Subaru WRX STI is being readied for the 2013 Nurburgring 24-Hour Race and was taken out to the Fuji Speedway recently to test the new improvements that were made to the race car. Subaru Tecnica International Inc. (STI) put their 2013 Subaru WRX STI race car through the paces and came away pleased with the results. This week the team still has the car in Japan for a “shakedown” before it’s shipped off to Germany. The car was improved with enhanced performance based on the know-how used for the development of the vehicle that won the SP3T class in the last 2 NBRs. The team will be shooting for their third win and isn’t standing pat with last years car. The newly developed 2013 Subaru WRX STI race car received a number of improvements. The aerodynamics were improved and made a difference in the cornering and handling at high speeds. Changes were made with the addition of a larger underspoiler up front to restrict front lift. New overfenders around the rear tire-housing and a defuser has been added on the rear underbody to also improve aerodynamics. Other improvements include moving the fuel tank to improve weight balance, and BBS forged magnesium wheels have been used to reduce the unspringing weight of the 24-hour Nurburgring race car. The improvements were made to increase speeds on the fast corners at the famous Nurburgrin track where they will run the 24-hour race. A new sequential gearbox will be coupled to the Subaru Boxer engine when it arrives in Germany in April. Many automakers use motorsports to improve the performance of the cars they sell to the public. Most of the racing technology filters down to the factory cars and makes a difference in everyday driving performance. Team Manager Ozawa said, “In addition to refining aerodynamics and reducing the unspringing weight, we have made many small improvements for better performance of the car. I feel under pressure with a 3rd consecutive win at stake, but we will make sure to do our job without any mistakes to fully demonstrate the ability of the car and the team”. The testing at the Fuji Speedway began in a low temperature of just 5°C, but the car had no problem. Toshihiro Yoshida and Kota Sasaki drove it in turn to check the feel of it. “My first impression is that the car feels a lot better now. I think the effort and each of the ideas from the engineers is working. Thanks to its lower centre of gravity, I can feel that the 4 wheels tightly hold the road”, said Yoshida. The testing of the improvements that were made to the WRX STI Nurburgring car have already gone better than last year, which sets up an expectation for a good result in the VLN endurance series in April. The team will compete in a shorter four-hour race in the 3rd round of the VLN endurance series at Nurburgring on April 13 to work on setups for the car before appearing in the official qualifying. After the “shakedown” at Fuji Speedway, the team will start preparing to transport the new 2013 Subaru WRX STI Nurburgring race car and equipment to Germany.